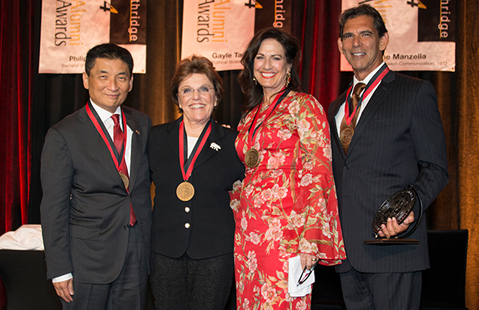 The CSUN Alumni Association honored IW Group Chairman Bill Imada ’84, Gardner Manzella co-founder Diane Manzella M.A. ’72, and Kashi founders Philip ’68 and Gayle Tauber ’72 for excellence in their fields at the annual Distinguished Alumni Awards. Read more about the Distinguished Alumni Awards. Unmanned aircraft, solar-powered charging stations, steel bridges and code to track Twitter were just some of the innovations on display at the fifth annual Engineering and Computer Science Senior Design Project Showcase. Read more about engineering students. CSUN students Giovanna Miranda and Terrence Harris won gold medals in their weight classes at the United States Intercollegiate Boxing Association’s National Championships in Miami, Florida. Read more about boxers. Sat., May 17, 8 p.m. This annual visit connects members of the Matador women’s basketball and water polo teams with the community while providing positive messages about working hard in school and on the field of play. The senator from Maine spoke to students, faculty and staff about working in government and bipartisanship. CSUN’s Child and Adolescent Development Alumni Chapter presents this event to recognize an outstanding community agency, award student scholarship winners and honor outstanding alumni. The event will take place from 9 to 11:30 a.m. at the Orange Grove Bistro.